Before we get to today’s Perfect Picture Book, I’d like to thank everyone for their enthusiastic response to last week’s book, Diva Delores And The Opera House Mouse, and all the nice comments for author Laura Sassi! I’d like to announce the winner of the hot-off-the-presses copy of Laura’s wonderful book! In spite of the fact that every time I turn around it is snowing, it IS in fact officially spring! And what says spring like bugs? Ooooo! Bugs! Bugs! Bugs! warmed the cockerels of my heart. Adorable and sweet! My 5 year old would still get a great thrill out of it. A peek at Spring today with such an adorable book for kids. 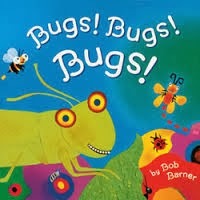 Kids are fascinated by bugs and are curious about their role with the growing season. Very colorful illustrations! I love the vivid and endearing art in BUGS! BUGS! BUGS! Lovely springtime choice. I have this book and it was very popular with my Grade 1 class. Great choice! I would like to join you in encouraging spring, but although those look VERY cute, NOT bugs, bugs, or bugs. Aargh. I won’t say I’m afraid of bugs, but once I saw a spider and I jumped up and down like a popcorn. Oh my gosh…just in time for spring…bugs! I guess that is what I love about winter…not the cold, for sure…but the lack of bugs. But this looks like a fun book, Susanna! I just spent the day in the garden on Sunday. Lovely. And lots of BUGS! This book looks fun, Susanna.